with " LN (Laugh Now) Mirther "
Laughter for Stress Release & Mood Lifting - MOVING you to Joy! Do you need more laughter in your life? Would you like to master techniques to relieve stress and feel better? Have you been curious about this worldwide movement? Thought about being a Certified Laughter Yoga Leader? If so this is for you! Next training is in OKC is not set yet. I will train in ABILENE, TX the fourth weekend of April. Get Certified! Laughter Yoga Leader Training ! ​ If you are not already my facebook friend I would love for you to "friend" me. FUN, stress reducing, gentle exercises of directed laughter, stretching and breathing designed for health benefits. All are invited to join us FREE! ​LAUGH Every TUESDAY "Tuesday Ticklers"
at 3400 NW 36th St just west of I-44 and NW 36th. see more details on the Laughter Gatherings tab. Start a LAUGHTER HABIT -count the days up to 40 - Laugh every day at least 10 minutes - driving, walking, on the phone join other callers laughing and breathing for 20 minutes. Northdale Park, Sunday's from 12pm-12:30pm, in Tampa Florida USA. Dr. Gold's Optimal Living Institute. You can LAUGH NOW for no reason with Laughter Yoga. Click on the "LAUGHTER Gatherings" page to find a form at the bottom of the page - fill it out and get email updates about events and laughter clubs. Or to schedule Ellen for your next club, meeting, convention or special event. Experience laughing as a voluntary exercise, independent of humor. foster JOY in body, mind and spirit! Get LEVITY in your life! Unique Features of Laughter Yoga In Business * Cost-effective and less time consuming. * Reduces stress instantaneously & one can feel the benefits from the very first session. * Scientifically proven with measureable results. * Easy to practice, anyone can do it. OUR HISTORY The first Laughter Club was formed in 1995 by a medical doctor in India. Now it is practiced round the world. Mr. Slater began sharing Laughter yoga in Oklahoma in 2007. Laughter Yoga is truly a life changing experience for millions. Anyone can do it; it is scientifically proven; easy to learn and a lot of fun. Please consider joining us at the FREE weekly Laughter sessions listed under the LAUGHTER CLUBS tab. People can feel the benefits right from the very first session. Got stress? LAUGH it away! LAUGH for the health of it! Learn about laughing with intention and how to teach others to laugh for the health of it. You will learn how to effectively lead laughter exercises, start and run a laughter club, how to market your services and share Laughter Yoga with folks of all ages and abilities. Fill out the contact form at the bottom of the training tab to let me know you are interested. 14 hours of laughing and learning with like-minded people. ​to pay on-line please go to my Square account website here. Text or call Ellen at 405-818-7997 to sign up or get details. Photos from recent training workshops completed. Ellen has trained over 70 new Certified Laughter Yoga Leaders. Laughter always makes us feel better! Meet Ellen Mercer Certified Laughter Yoga Teacher and Leader Founder of "LAUGHTER MOVES" Your source for lighthearted, fun, and health / wellness promoting seminars or laughter sessions. Ellen started laughing using this intentional laughter protocol, back in 2007 when she realized at a Laughter Yoga seminar that she probably had a laughter deficit. Mercer is Oklahoma's only active and most experienced Certified Laughter Yoga Teacher / trainer. Since that first laughter exercise experience, where she laughed to tears, her expertise as a "laughter professional" has steadily grown. Ellen was Certified as a Laughter Yoga Leader in 2007, re-certified by Sebastian Gendry in 2009. Ellen's enthusiasm for Laughter Yoga grew exponentially after a life changing week in Chicago in early 2010 where she was personally trained by founder Dr. Madan Kataria and 3 USA Master trainers, Sebastian Gendry, Jeffrey Briar, & Laura Gentry, as a Certified Laughter Yoga Teacher. Ellen loves sharing the gift of laughter for the health of it. The laughter habit has profoundly impacted her health, and her spirit of levity. 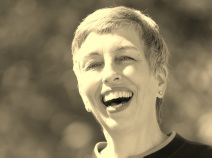 Being a skeptical, scientific minded person, Ellen was impressed by the research documenting the benefits of laughter, both humor based and in this intentional guided laughter practice. Ellen has traveled Oklahoma and the area, laughing with or training nurses, therapists, physicians, clowns and comedians, court reporters, teachers, hospice volunteers, social workers, support groups, clubs, seniors and students of all ages. She plans certification workshops 3-6 times each year. Over ninety new Laughter Yoga Leaders have learned from her the skills to share the proven benefits, stress release and healing of intentional laughter. Ms. Mercer shares simple techniques for unconditional laughter and yogic breathing. Call at 405-947-2653 to schedule a laughter event, For senior care facilities the rate is $60 for a one hour session. Whole Food is the​ BEST nourishment for your BODY! I have a strong interest in lifestyle & diet-based approaches to disease prevention, but I insist on rigorous, high-quality, research-based data in order to recommend a particular product, lifestyle or dietary modification (or use myself). That’s why I love this concept that has kept me healthy for over a decade. ...Whole Food Nutrition made easy! Eat more Fruits & Vegetables to improve your health! conducted by investigators at leading hospitals and universities around the world, and published in peer-reviewed scientific journal. It contains a much wider variety of naturally occurring vitamins, antioxidants and phytonutients than traditional vitamin supplements. That is why I have studied it and choosen to eat it for the last 12 years. It makes a difference and fills the gaps.